June 15, 2015 June 15, 2015 ~ Trevis Dampier Sr. I have tried all kinds of fast food burgers in my time from Jack in the Box, McDonald’s, Carl’s Jr. and Wendy’s. Each of these gives me a memory for my favorite meal from a small child, to a teenager and unto adulthood. These memories I have passed down to my children by taking them to the same fast food places that I grew up with. Seems like they got addicted at a young age do to all of the commercials on TV. The marketing is so good at McDonald’s I think my son’s first couple of words was ‘Happy Meal’. No exaggeration at all! I’d have to say that a Happy Meal is what my kids favorite fast food meal was while being toddlers but once they reached about 10-11 years old a new favorite was introduced and that was Wendy’s. At first I was shocked that Wendy’s became our favorite fast food burger in our home in the millennium because when I was young it wasn’t my favorite. Don’t get me wrong, I loved the Jr. Bacon Cheeseburger and the chili was one of their trademarks when I was in high school back in the mid 90’s but not enough for me to crave more and more. But something definitely changed since those years and my taste buds and stomach identified that immediately when I took my son to Wendy’s for the first time a couple years back. I was getting my oil changed at Speedee and there was a Wendy’s right next door and we were starving. I glanced at the menu and I ordered a Dave’s Hot and Juicy 1/4 pound single(might have been called something else then) and my son got a Jr. Bacon Cheeseburger. First let me just say that the burger looked impressive when I pulled it out of the wrapper. Perfectly accessorized and mouth watering to the eye. Just as if it were the same burger on the TV commercials. I dove right in and the burger was extremely hearty and juicy! The accessories were fresh and delightful as well. The accessories comprised of purple onion, lettuce, tomato, pickles, mustard, ketchup, mayonnaise and a sweet delectable bun. I moaned and groaned and looked at my son as he did the same..
We were enjoying this moment as a new history making experience in our lives..Man this is good! True live action eating! The burgers are still ridiculously good and hands down better than any fast food burger that I have had. 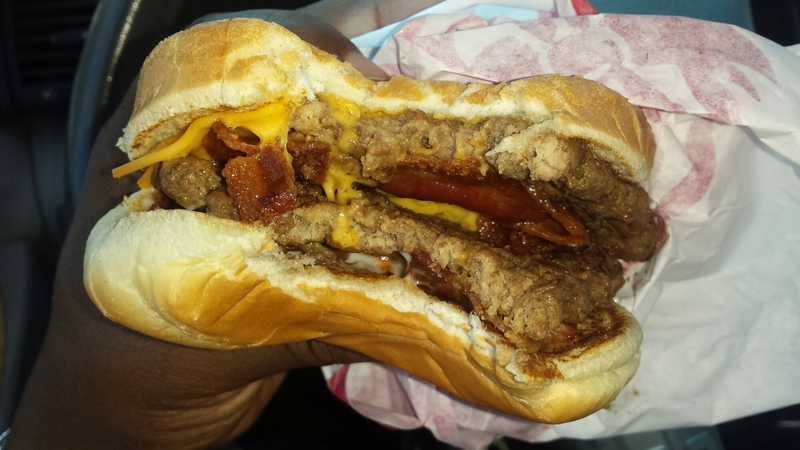 Today I ordered the Son of the Baconator, and boy let me tell you that this is a heavenly melody to the palate! The bacon was sweet and succulent and can be eaten on its own; while the beef patties were cooked perfectly and still juicy, flavorful and soaked with goodness. Combined with the bacon this burger really packs a punch in bacon lovers bliss! If you haven’t been to Wendy’s in a while I suggest you go back and try one of their burgers. I guarantee you will not be disappointed! < Previous I’ll Place all Bets on Grilled Chicken on a French Baguette! Next > You’ll need a Romantic Room after Dinner at Pasta Moon!